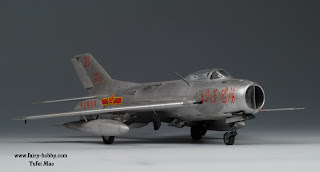 It is always a pleasure to be able to post on a Chinese aviation subject, but especially to show these images of Yufei Mao's 1/48th scale model of the Peoples Liberation Army Naval Air Force J-6 (MiG-19S) "Farmer" piloted by Mr Zhushu Wang in which he shot down a USAF F-4C (63-7577) from 390th TFS, 366th TFW "The Gunfighters" which had strayed into China air space over Lingshui, Hainan Island on June 26,1967. Yufei built the model using the Trumpeter kit, but with many changes and improvements detailed in his build report here. Yufei found that the fit of the kit was good but that it suffers from some shape issues. 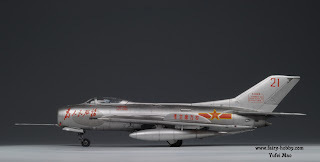 He took a large number of photos of a retired J-6 near his home to study the aircraft, and then identified that the most significant problem with the Trumpeter kit were the poorly shaped nose and an incorrect windscreen. He managed to solve these problems by using the HiPM kit nose which is quite accurate and by sanding/polishing the original Trumpeter windscreen. To further detail the kit he added an Eduard PE set, Pavla Models resin gear bays and a NeOmega resin ejection seat. 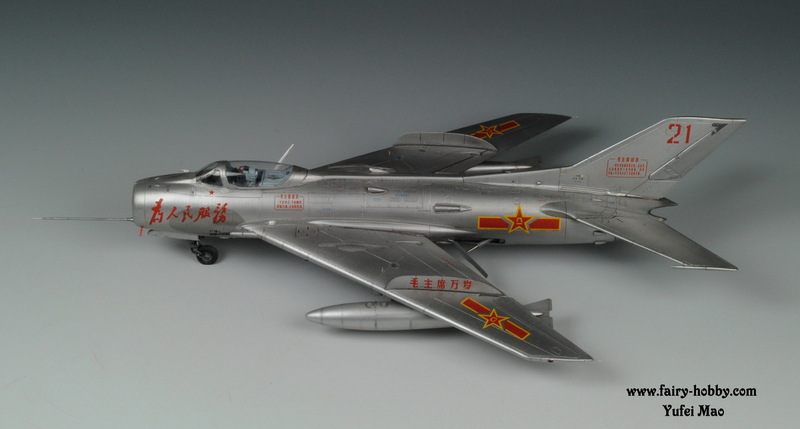 He also replicated all the rivets,with the help of the photos he had taken of the real J-6. The excellent pilot figure is from his own range of hobby accessories. 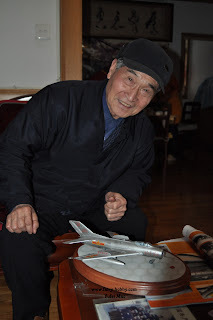 Yufei presented the model of the J-6 to its former pilot Mr Zhushu Wang, who lives near his home in Shanghai. Yufei's model was featured in Air Modeller Issue 34 and the Chinese magazine Model World for August 2011. 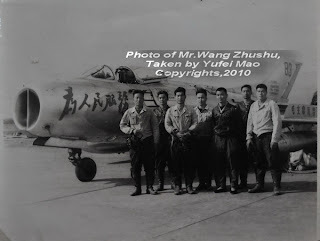 Yufei was able to contact Mr Wang and visit him in 2010 after seeing a TV documentary featuring the Navy fighter pilot. Mr Wang had served in the 16th Regiment of the 6th Division of the PLANAF at Haikou airfield on Hainan Island. He showed Yufei many rare photos of the J-6 aircraft from his unit including gun camera stills of the combat where he shot down the F-4C. 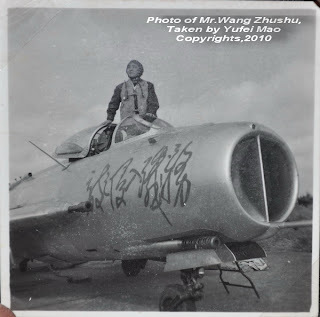 It was the time of the Cultural Revolution in China and the aircraft sported slogans such as "Serve the People" on the left side of the fuselage, "Must Destroy All Intruders" on the right side and "Long Live Chairman Mao" on both wing fences. The aircraft was also decorated with a red star under the windscreen on the left side to mark the victory over the F-4C. 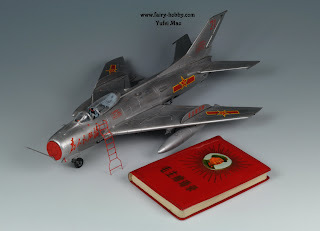 Mr Wang and his wingman Mr Lu Ji-Liang received a First Class Merit Citation for shooting down the Phantom together with a small honour note, a pen and a series of the Collected Works of Mao Tse-Tung. Mr Wang retired from the PLANAF in 1988. More photos of this excellent model are to be seen here. Many thanks to Yufei for his kind permission to show these images here. 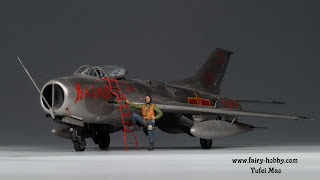 Yufei, congratulations on a beautiful model.